Although I can manage a country-style loaf of sourdough bread, more refined baking is my Achilles heel. I avoid making pastry the way I avoid hanging doors or framing windows. In a post-apocalyptic world where my survival depended on advanced carpentry skills to keep the zombies out I would muddle through, but in the meantime I’m content to stand back and admire better bakers than I. I’ve made what I call the Lazy Man’s Sheet Pan Apple Tart successfully a half-dozen times. It’s delicious, forgiving (to a point) and clumsiness with the crust only contributes to its rustic appearance. It seemed a no-brainer for a post when I’d be on my own while Jody tended to her new restaurant. Alas, The best laid schemes 0′ Mice and Men etc. etc. More on that in a bit. This tart takes its inspiration from a recipe in a favorite cookbook, A PLATTER OF FIGS (Artisan, 2008) by David Tanis, the part-time head chef at Chez Panisse. One of the book’s charms is arrangement into seasonal menus rather than the more conventional appetizers-soups-vegetables-etc. The food manages to be both simple and deeply sensual (sample fall menu: Steamed Fennel with Red Pepper Oil, Roasted Quail with Grilled Radicchio and Creamy Polenta, and Italian Plum Cake). It’s filled with stuff that you really want to make, even if you engage in a bit of mixing and matching with the menus or just cherry-pick something for a week night. Any of the items will provoke swoons of gustatory pleasure. 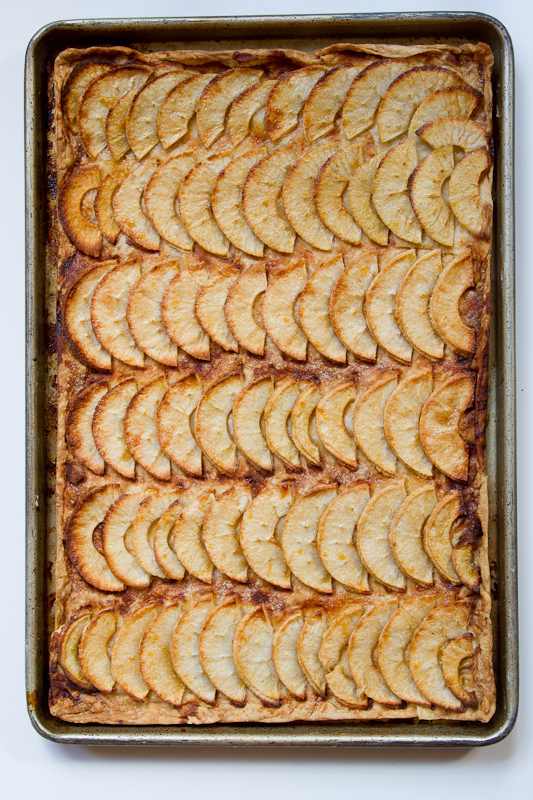 Tanis’s unpretentious apple tart is made on a sheet pan. The lazy man in my version comes from the fact that I use a mechanical apple peeler (hey, I’m a guy, I love gizmos, and this one really works), I use fewer apples than he does (I find they caramelize faster), and instead of following his instructions for magicking homemade glaze out of apple cores, sugar and water I take his advice and just thin a little apricot jam. For purists, I’ve included the recipe more or less as he wrote it (increase the quantity of apples to 3 pounds – about 8 apples – instead of the 2½ I use). I’ve made this tart with apples and pears, fiddled with the amount of dough and quantity of fruit but it seems not much to matter. It always comes out in a glorious burnt-around-the edges kind of way. The recipe suggests a baking time of about 45 minutes. I’ve made the tart and it has taken that long. I’ve also had it take up to 15 minutes longer. How thin you slice the fruit, how much fruit you use, the thickness of your crust, your oven, etc. – all of them seem to affect the amount of time it takes for the fruit to brown around the edges. David Tanis has you bake the tart, then brush each portion with glaze right before serving. I prefer to brush the tart with a bit of glaze about three-quarters of the way through baking, then follow Tanis’s example before serving. Glazing appears to speed the caramelizing process. The first brushing is completely absorbed, as you can tell from the photo of the tart right after it emerged from the oven. Back to gang aft agley. Our modus operandi is for Jody to cook while I photograph. Jody’s daunting schedule made that unlikely last week and the cupboard was bare of any posts saved for a rainy day. I volunteered to fly solo, envisioning myself pausing while I considered the compositional implication of dough positioning, the esthetics of apple peels shot through a macro lens. I saw myself snapping off a few frames, then advancing to the next culinary esthetic juncture. What could go wrong? I discovered that trying to mix dough, then washing your hands, taking a picture, going to the next step, washing your hands, taking a picture, etc. was a sticky nightmare, at least with this crust, where speed and minimal handling of the dough are a priority. My hat’s off to any food blogger who can actually do this (are you there, Sally, at Cooking Lessons?). I’m sorry but there are no photos of critical tart crust steps (actually there aren’t really any critical steps in this recipe). You’ll have to stumble along as best you can. Secondly, the preheating oven began belching black clouds of smoke. We had a house full of people this past weekend and did a lot of roasting. Someone probably gave a pan of sweet potatoes a little too vigorous a stir and splashed pomegranate molasses on the oven floor. In any event, there was nothing for it but to throw open the windows, allow the oven to cool, then clean it, by which time I’d moved into the time-to-take-Roxanne-to-dance zone. 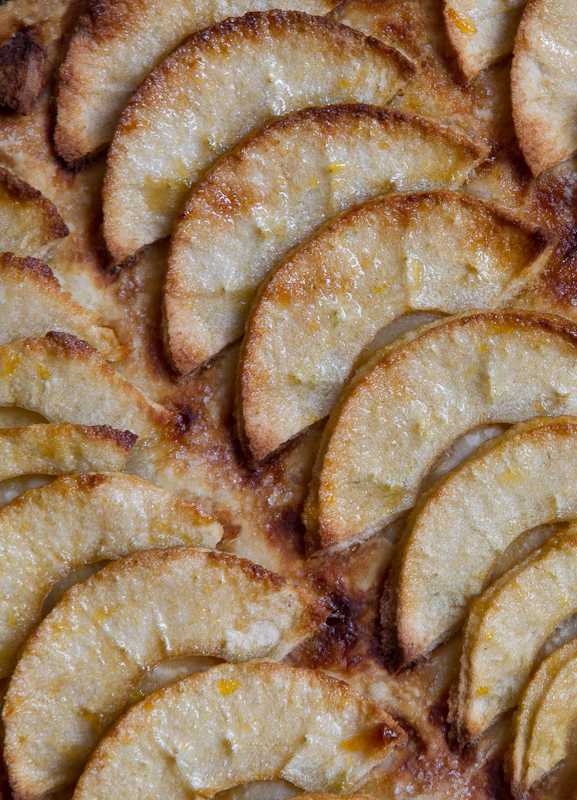 I stashed the dough in the fridge and finished the tart the following day–peeling and photographing as my apples slowly oxidized (that’s not cinnamon on the apples in the photo of the tart before it’s baked). But just as Tanis said, it didn’t matter that the apples darkened. It was still great. In fact, almost as satisfying as a well-hung door. Put the flour, butter and salt in a bowl. With your fingers, work the butter into the flour until it looks mealy, with some large flecks of butter remaining. Pour the egg-ice water mixture into the bowl and quickly knead the dough until it comes together. Only a minute or two – you don’t want the butter to melt. It will be soft, sticky, and, though gathered together, a little rough looking. Divide the pastry in half (there will be enough for two tarts; you can freeze one half for later). Roll out the pastry to a rectangle, approximately 11 by 16 inches, using a 15½-by-10½-inch baking sheet as a template. Transfer the dough to the baking sheet and let it relax. If your dough isn’t perfectly rectangular just patch with bits and pieces as necessary, then trim the edges to fit the pan with a little going slightly up the sides. Cover with plastic wrap and refrigerate. Preheat the oven to 375°F. 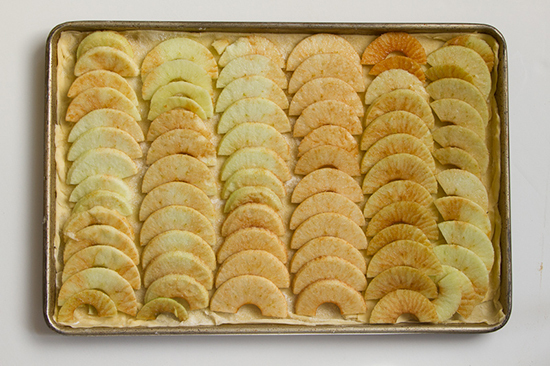 Sprinkle sugar generously over the apples and bake until that are beautifully browned and crisp, about 45 minutes. About ¾ of the way through the cooking I brushed a thin layer of glaze over the tart. After the tart has finished allow it to cool on a rack. Just before serving, reheat the glaze. 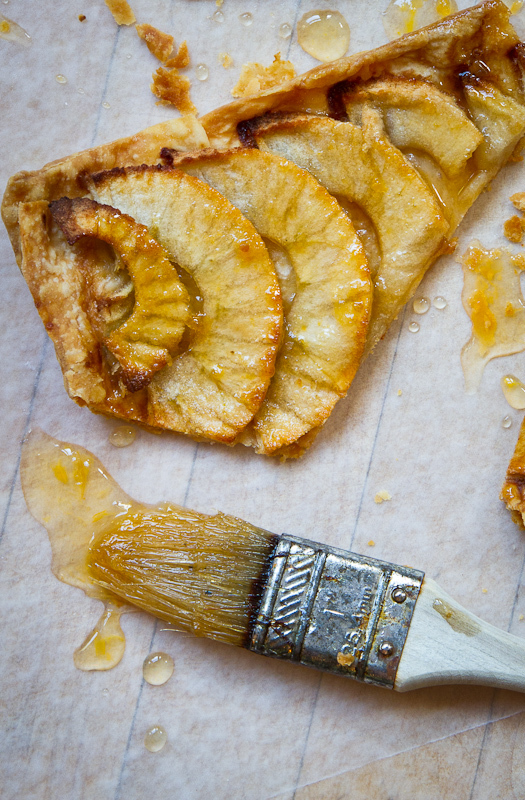 Slide the tart from the pan onto a cutting board. 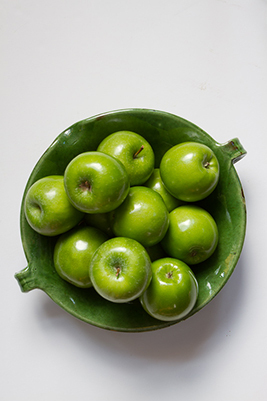 Paint the apples with the warmed glaze. Slice into small rectangles or triangles or whatever strikes your fancy to serve. This entry was posted in Dessert and tagged apples, baked, dessert, fruit, tart. Bookmark the permalink. Looks lovely! Also, that last picture is gorgeous. I wouldn’t call this lazy — more like “inspired”!!! Beautiful — ’tis the season for apple tart, after all. Congrats on a beautiful tart — and a fun post! Looks delicious. I would agree that it is more inspired than lazy. Well done! ….but I digress. Your recipe sounds wonderful. Thanks for sharing. I know what I’m making when I get home tonight. I’ve got 20 pounds of apples from the local U-pick just waiting for little deserts like this. Lovely post and very delicious looking tart. I’ve tried galette type tarts twice with not the greatest success, so something like this might be my next tart adventure. My blog is a solo adventure and I do all the baking and photographing by myself, so I haven’t figured out a way to make pastry and take photos at the same time. As you said, it just gets too messy, and I don’t want to end up with bits of dough in my camera. Um, who you callin’ a masochist? I like this whole post and if you would make this tart again and invite me over, it could be lazy lady’s tart. p.s. the glaze during baking is essential–those apples never seem to brown on their own! Try putting the camera in a Ziploc bag and cutting a hole for the lens. Works great! I use this trick when photographing my wood-working projects to prevent glue and sawdust from getting into the camera. You may need a rubber band or two to get the bag to stay in the right spot. @TacoMagic: Thanks for the good suggestion. It might be a bit tricky because I am not using a DSLR but rather a point and shoot (although it has manual functions) so the lens retracts if you let it sit too long. And yes Ken I agree, it is a bit masochistic. I might just leave those actions shots for the other bloggers. Or maybe enlist a helper every once in awhile. Lazy or not, I’m impressed. Yummi… looks like even I could manage to bake it ! Yum! You know what? It STILL sounds too hard. There needs to be an even lazier man’s apple tart. Maybe the recipe can include just buying one from you? I’m well impressed with this recipe and your photos – delicious! Like the apple tart simple but stylish. Yes, it is hard not to get a bit of food on the camera when trying to cook and shoot photos at the same time. I love anything that starts out with lazy man! Your photos are awesome. Don’t know if I will make this – saw lazy man and thought pre-made pie crust! Ha ha! But I will print because photos are so beautiful and I think it would be delicious and I might actually make it one day. Thanks! Hmmm… I think I will try combining your apple sheet pan concept with Sally Schneider’s dough recipe. She has a minimal fat, maximal flavor dough that she uses for free form tart and the result is delish. I suspect that her dough will go very well with your sheet pan / apple layering style and will result in an ethereal pie. I will definitely subscribe to your blog. Have a wonderful day! I’m not a great cook, however I would like to sample your delicious treat. How soon can you baked it and send it special delivery? Awesome photos!!! Yum-o! I will have to bake this on a rainy day. Easier than pie. Wow. I’m totally going to try this! Cheers! Your photgraphs are delightful! Thanks for sharing! Stunning post Ken, with seriously good photos. Lazy I think not……..more like creative. Beautiful! I love your photos too! Mmm. Looks delicious and simple enough for me. Nice tool you got there. Thanks Ken. I am definitely inspired. I was looking for a reason to abandon (not for always) the faithful apple crisp I have been making over these past several months of pregnancy. I’ve found it! Thank you sir. I love my peeler-corer-slicer gadget! It is a genius invention, and a huge time saver. Your pictures of it are fantastic. It’s a work of art! I have that same gadget and not embarrassed at all to use it! I love how thin this is, almost pizza like…for dessert! Great photos!! Looks absolutely delicious and so pretty. Delicious, beautiful, and maybe I’m just older than all of you…and brought up by folks who were young adults during the depression…the photos of the apple peeler are beautiful, and yet…I kept thinking “waste…look at all that waste..” and I’ll stick to using a sharp paring knife (loved the curved kind, for fruit) and just take off the skin, thinly. Sure like lazy men like you, who create! I found the comments in your post about the combined effort of photgraphy and cooking food time both funny and spot on. I’ve coated my camera more than once with flour, grease and various levels of goo more than once. I’ve always thought that should be one of the quick fire challenges on Top Chef. Your pastry looks amazing…congrats on being pressed. I have to admit, one of my greatest fears is baking. I could never tell if it was my oven or me that ends up burning the pastry. I can cook everything else, but ask me to bake something and I lose all confidence. This recipe looks easy enough and I do love apple tart. I’ll have to try this recipe and hope for the best! Will give this a try. I’ve got the peeler, and the kids love using it and eating the curly skins. Will have to try it with rice flour though. Will let you know how it turns out. My GOD! I literally drooled reading this post! The gadget looks cool. I think I will acquire one when I move into my own house soon. This looks really yummy and very easy to do! Gonna give a try… looks like something good to make during the holidays! Have a great weekend!! I’ve been working my way through apple recipes and documenting some of the results. That nifty gadget would have come in handy when I was peeling and slicing five pounds of apples, while working with bread dough, and attempting to photograph the fruits and grains of my labor. I like your relaxed, humorous attitude to cooking and photography and I am very pleased to have discovered this blog. Wish I lived in Boston, so I could visit your restaurants. 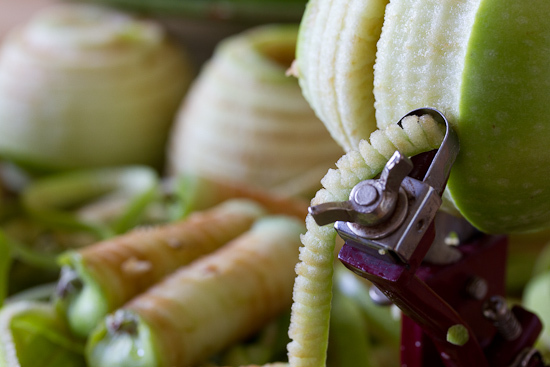 how cute is your little apple peeler?? My mom had one like that when I was growing up – it must save you hours of peeling! PS. Tart looks incredible. obviously. Wow! These look absolutely delicious…I’m not much of a baker as most of my things don’t turn out to good. So, I just buy them at the store or only eat the baked goods myself. Wow, yum yum! This is a great recipe, thank you! Also love the photography throughout your blog! Beautiful food and photographs…two very important components to a successful blog, which you have. A scrumptiously written post I will have to try this recipe today, thanks for sharing! This looks awesome! I want a slice now (with a huge scoop of vanilla ice cream along side it). Yummo! Ooh, sweet potato and pomegranate molasses. I just did a quick search on your blog to make sure I hadn’t missed that post. For now, it’s a kernel of an idea in my head that I might have to explore this week. Of course, I don’t actually have any sweet potatoes, but a butternut squash came in this week’s CSA which is as big as my cat. So much to think about! Also, I haven’t yet made the sage pesto — not sure why as I have all the ingredients in the house — but just wanted to say that your squash and squash seed roasting method were pitch perfect. Thanks again! Looks delicious. I am going to try this with my little ones. Seems like a nice one for letting little hands help. Especially with laying out the apple slices. This is fantastic and I’m not much of a baking aficionado myself, so I’m so glad this can be an easy one!! Also, I’m from the south, and I remember as a kid, my dad getting out his pocket knife and trying to peel an apple and get one entire peeling. We would enjoy him peeling so much, we’d hand him more apples to peel for us. Thanks for sharing Ken!! Looks Yummy! This looks so good I think I will try it as a cabin fever pastry for this weekend. It going to snow up here in my area of the Northeast and we need a little dessert for the weekend. Who knew it was going to snow in October! I cook and bake a lot and post some of my work on my blog, but I have never made a tart. Why I don’t know! This makes tart making look fun. I may try this with some of the Ozarks fine fall apples. The last photo is marvelous! And yes, I agree… cooking and photographing is a trick! YUM! I’m a total hack at pastries, but I love them too much not to try. This recipe looks pretty me-proof, so I’m going to have to give this one a go the next time I feel the urge to bake. Thanks for the tips! I thought that was a painting, not a food. This looks great I am excited to try it! That’s awesome and looks yummy! I love the gadget too! Wow–great for apple season here in Virginia. Looking forward to trying this. looks so yummy i wanna try to bake,. that dessert !! Thanks for the great and easy recipe! I will give it a try. Congratulations on being Freshly Pressed! I love that it introduced us to your beautiful blog. My husband and I (35 years and counting) enjoying spending time in the kitchen together, too. 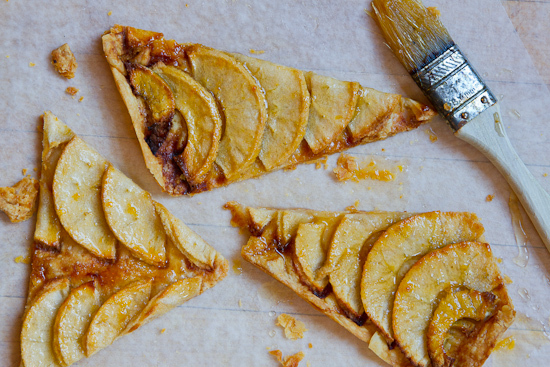 This Apple Tart looks wonderful. Right now I’m brainstorming ideas for cooking with the grandkids. They are only 21 months old and 7 months old, but I foresee a future of fun in the kitchen with them, sharing and learning together. This would be a great one to try, for example. Thanks for sharing! Oh, by the way, in the Philippines there are two different condiments made with seafood – fish sauce, and shrimp paste. Both fermented. The fish sauce is comparable to Nuoc Mam – a light colored liquid. Shrimp paste is dark reddish-black with bits of solids mixed in. Both are acquired tastes for Westerners, but I believe they not only add depth of flavor but probably concentrated vitamins goodness. The Philippine version of that is called bagoong. And after my last comment, I looked it up. Sure enough – loaded with nutrients. Also very salty. Which in ancient times was probably a plus, not a minus. I’m not sure why this is called the “Lazy Man’s” anything. Slicing all those apples is serious work. I’m so lazy, I don’t even peel the apples when I make my apple dessert. If I had that gadget, I might consider it, even though I don’t like specialized appliances. This one reminds me of something my grandmother used. I LOVE the way it is made! Amazing photography! Or maybe I sholud say: Mouth-watering photos! Curry! I just remembered, that’s how I used it. Now you’ve got me thinking, I’m going to have to go out and poke around some Asian grocery stores to see if anyone carries it. 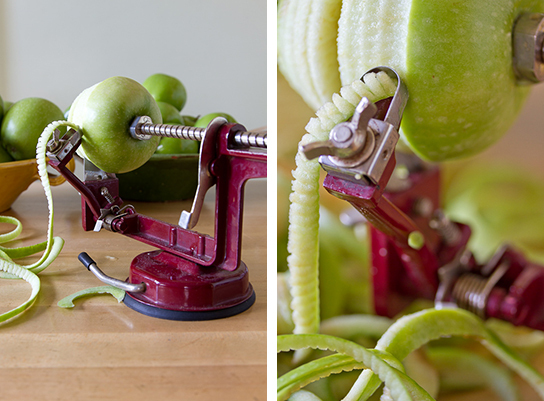 My wife has the exact same apple peeler, it IS awesome and better yet, the kids love working it. I feel your pain regarding the challenge of shooting and cooking at the same time, which is why you rarely see in-process photos on Oui, Chef. I hardly ever get them when working on a savory dish as there’s too much of a time crunch getting everything ready for the table, but every now and again I’ll shoot a weekend pastry project. All that said, I think you did a great job with these photos, I really like the ones of the peeler. It looks good tart and looks so yummy. Gorgeous step-by-step photos! I can’t wait to try this. 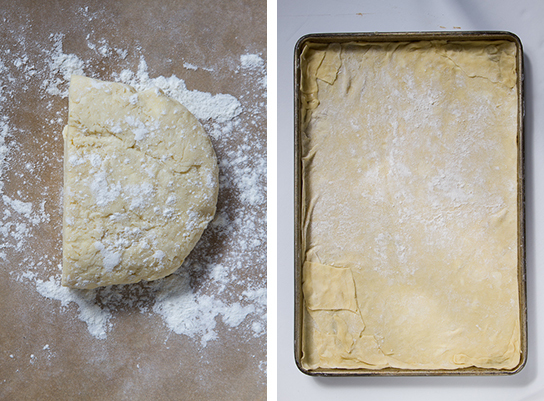 I love these photos, especially the glistening pastry brush in the first photo. (It’s funny how the apples almost look like pineapples, isn’t it?) I also appreciate that you didn’t hide the bit of patching you did on the crust. I have puff pastry in the freezer and this will be a great use for it. I love this book but hadn’t noticed this recipe somehow. It always makes me laugh when I “discover” a recipe I’ve had sitting around for ages via a great blog post. PS I read your bio–as I was reading i was excited to see you were in the area (we live in greater Boston) and then even more excited to see you were the chef behind Rialto! We had a lovely meal there just a few months back and are planning to return soon. Definitely bookmarking this blog. This looks delicious! And I love how when you slice it out it looks just like a pizza slice. The dish looks superb! Well done! Not only do I think you have an outstanding cooking ability, but the way you describe the dish in words is enjoyable to read! Each word your write is a detail that contributes to the formulation of the imagery that, as readers, we attempt to establish in our minds. It wasn’t a struggle to envision what you were describing and that is an attribute that readers truly appreciate! My favorite phrase was when you said “gustatory pleasure,” what great diction you have! You are quite the food writer! Don’t you kind of want to make everything with apples at this time of year? Looks fantastic. BTW, our family tradition is to ALWAYS hit Provender after the beach in Little Compton. It’s still a wonderful place, and they make the best PB&Js anywhere. Beautiful blog! Thanks for the inspiration! Now I need to go buy a better camera. Well presented and very inviting. i L.O.V.E. the apple peeler! i use it to make an apple accordion stuffed with peanut butter! not pretty to eat but SO delicious! As “lazy” as this might be, it looks like it will surely hit the spot. Wow! I want that apple peeler… I made some apple dessert today and thought that one of those would come in handy… Your tart looks wonderful. Looks good! I’m off to peel apples, now. I am a lazy man, :D, and i would try. Thanks for your sharing, nice work. Looks great! My wife should see this..haha. That apple peeler is way kool though. YUMM… It’s 12:22am where I’m at… so of course food is looking good! I am really excited to try out this recipe & have my mom taste it (because she is my baking Sensei)! I have an apple peeler like this one and never use it … one piece jumped out and I don’t know where it fits in to put it back. Well, beautiful tart and pictures, love your blog. Ken – I probably go through a camera a year just due to dirt build up as I try to document my recipes. Doughs are the worst – my last post was a very wet gnocchi (strangolapreti) yuck. How many times do I stop what I am doing to clean my hands, take a picture, go back to work – oh, there’s another shot…I clean my camera fairly often, but it does take its toll. Switch to wine – taking pictures of bottles and glasses is much easier on the camera (although a bit harder on the liver). Looks amazing, thanks for sharing. I used to have that apple peeler. I loved it, too. Why? Because it did work and it was all mechanical. Not a single microchip on site. Yet…it broke. LOVE IT. gives you less work to do. the apple tart looks delicious. mjum! I love love love loose, but perfect, recipes like this. Your tart looks so gorgeous! Love the shards of tart picture (placed before ‘Jody’s notes’). I think I will finally defrost the tart dough that has been sitting in my freezer, begging for attention. wow. How did you do that????? ha ha ha its amazing. I’m in charge of dessert this Thanksgiving and I’m making three pumpkin desserts and didnt think I could add anything else but I’m adding this to my list. People love apple and this looks like a sinch to make! So excited! How do I add a pwerpoint presentation to my blog? Can anyone send me the page link that explains this? Well done. I adapted the recipe to include some excess marzipan/chocolate that we had left over. Melted with a bit of cream, and it formed the first layer, under the apples. Thanks for the base recipe! Hello very nice site!! Man .. Beautiful .. Amazing .. I’ll bookmark your web site and take the feeds additionally?I am glad to find so many helpful info right here in the publish, we want work out extra techniques in this regard, thanks for sharing. . . . . .
Fortunately I have just enough apples in the house. I will get busy. I think a book with recipes and stories-like the story about preserved lemons-which I had never heard of and which I now have in my fridge. Stories about where you find the recipes and why you include them in your menus and pictures of your restaurant kitchens in action as well as food celebrated – i guess that means food for parties and holidays. I personally like books that have alot of pictures. My daughter agrees. Also I have never seen a really good cook book about portable food. Since I pack lunch all recipes must be good for leftovers. I like having both Ken and Jody as ‘voices’ in the blog: makes it conversational and adds depth. Perhaps you want to continue this in your book? One thing that I have noticed from my knitting books is that if you buy a copy of the book you can get an ebook for either free or a reduced price. If you buy only the ebook, then the price is closer to the print edition. Perhaps a monthly or seasonal edition which would allow you to do it by subscription with a book option at the end. I think the key is to have both an internet and a print presence. (There is an app called Paprika that allows participants to browse recipes and creates a shopping list for them. I have heard good things about it. ) Although I love actual books and continue to buy them, there is a huge convenience in being able to download them instantly.